The in basket: Henry Sicat proposes a change in Silverdale to make travel easier. 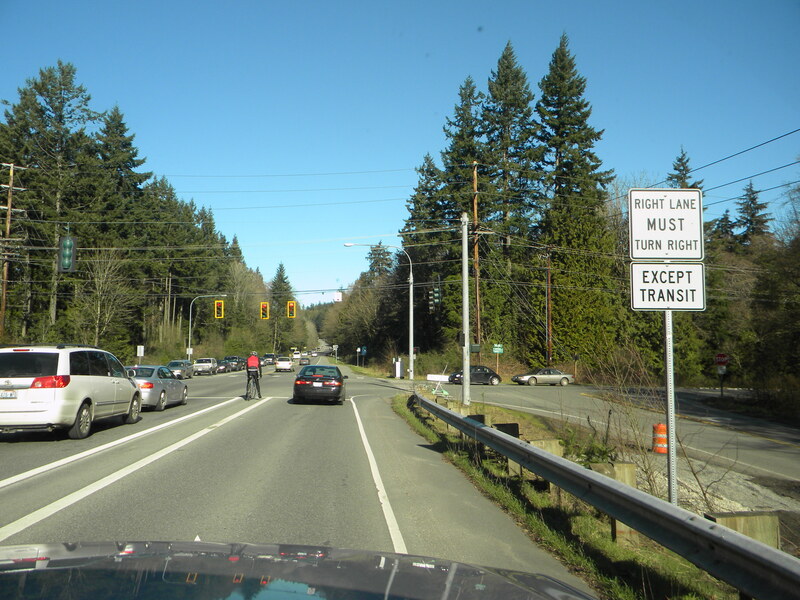 add a right turn lane from Ridgetop Boulevard to Silverdale Way northbound, just like the existing right turn lane coming from the opposite direction. “This, I believe, would help alleviate the congested traffic at that busy intersection,” Henry said. The out basket: “There are no plans to improve the intersection as your reader suggests,” replies Doug Bear, spokesman for Kitsap County Public Works. “The costs involved in a project like this would make it a capital project and would need to be considered as part of the Transportation Improvement Program (TIP). “An explanation of the TIP process is available online at http://www.kitsapgov.com/pw/sixyear_tip.htm,” he said. That’s also where you can also see the most recently adopted TIP to see what road projects the county has planned through 2017. “During the spring,” Doug added, “we actively encourage residents to submit ideas, like the one your reader mentions, for consideration in this process. Suggestions are considered and rated …. Questions about the tip process can be sent to Jim Rogers, transportation planner, at jrogers@co.kitsap.wa.us. The in basket: Bill Slach says, “On westbound Sedgwick (Road) at the light where you turn right onto Highway 16, there is a lot of room on the right side and folks repeatedly make illegal right turns by crossing the fog line. Isn’t there enough room there for a turn lane? “The shoulder areas vary widely in width,” he said. “The south side could be made narrower as well as the north side to give enough room to make a turn lane,” he proposed. “This wouldn’t be a costly fix – some paint ought to do it. The middle area of the road created by the center merge lane could be narrowed by a foot or so and give enough room to create a turn lane,” he said. “As it is, folks now cross the line on the right by only a little when cars stopped at the light give them room. “Foot traffic and pedestrians?” he asked, recalling the state’s reason a right turn lane couldn’t just be carved out of the shoulder. “Where are they? The ones I see are on the south side of the highway since they are going to the gas station or McDonalds. The out basket: Though there are places all over the county where drivers routinely commit the violation of crossing the edge line in their right turns, this is the only place I’ve been asked about it. 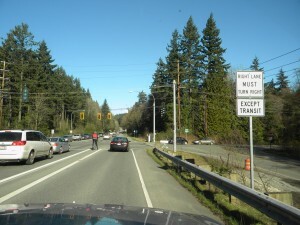 In 2007, a suggestion was made that the edge line be erased for a distance to make those right turns legal. The answer then was no, that would jeopardize bicyclists and pedestrians. The answer is still no, says Steve Bennett, the traffic operations engineer for this region. “We continue to believe that it is necessary to widen Highway 160 (Sedgwick) in order to safely provide the space for the right-turn lane. Well, that’s a sure bet. Getting onto westbound Sedgwick from Bravo Terrace, which serves a motel, McDonalds, Shari’s, Dairy Queen and others, is scary enough without losing the refuge lane a left turner can use. The in basket: Brian O’Kelley asked me to settle a bet he had going with a friend. “My buddy says that people turning left into multi-lanes must select the inboard left lane,” he said. “Thus people across the intersection wanting to turn right on a red light can do so freely, regardless of the crowding and honking of horns. “I say I don’t think I’m required to take the inboard lane, but even if I am, right-on-red turners have to wait for the intersection to be clear before they can proceed” Brian said. . The out basket: Well, I could help out his buddy. Brian lost the bet. Lt. Pete Fisher of the Bremerton police traffic division and Trooper Krista Hedstrom of the State Patrol office here confirmed my belief that is interpreted to forbid swinging wide into any other lane but the inside through lane of the highway being entered. It would be unusual for a driver to be cited for swinging wide, but I told Brian that should a left turner and a right turner collide in that outside lane, the left turner would be held responsible. The right turner can do some things that might get him cited, too, like not coming to a complete stop at the red light or swinging wide himself into other than the outside lane if there were more than two lanes moving in that direction. But that wouldn’t excuse the left turner’s mistake. The in basket: Mike McDermott of Poulsbo wrote in late July saying, “Driving north on Silverdale Way, coming down the hill towards the intersection where it turns into Viking Way (at Luoto Road), the shoulder (bike lane) curves to the right to make way for a right-turn lane near the gas station. “A cyclist was in the bike lane, and if he wants to continue straight through the intersection he has to cross the solid shoulder line to enter the lane going straight, while I, in a car wanting to turn right at the intersection, simply follow the road as it curves to the right, without crossing any lines to be in the right-turn lane. “The cyclist was just in front of me in the bike lane, and I saw the potential for an accident should he want to continue going straight, so I stayed behind him until I knew what he was going to do. Sure enough, without any indication he was changing lanes, he crossed the solid shoulder line to continue straight. Had I not considered the potential for an accident, we would have collided. The out basket: It’s a helpful question, as a new kind of bike lane alignment has shown up here, on Viking Way at Finn Hill Road in Poulsbo and on Sheridan Road at Wheaton Way in Bremerton. There may be other places I haven’t noticed. In those two places, a passage marked by a dotted line provides a path for bicyclists on the shoulder to reach a narrow lane between the through lane and the right turn lane. But that’s not the alignment where Mike had his experience, and the answer to his question is pretty straight forward. Deputy Scott Wilson, spokesman for Kitsap County Sheriff’s Office, says, “The motor vehicle has the right of way in this scenario. The bicyclist would have to yield to all other traffic, traveling in same direction/lane of travel, prior to entering the roadway to cross the intersection. “It’s the same as if a car was stopped on the shoulder and the driver wanted to re-enter back onto the roadway,” Scott said. “The driver has to wait until traffic is clear and it’s safe to enter back onto the roadway before proceeding. “If there had been a collision between Mr. McDermott and the bicyclist, the bicyclist would have been found at fault for causing the collision,” said Scott. But what about those two spots and any others where a dotted lines indicates a path for bicyclists to get from the shoulder to inside the right turn lane. The answer is different there. Sgt. Andy Pate of Poulsbo Police says, “The bike lane you are referring (to) is a designated bike lane by the city. Due to the right-turn-only lane on northbound Viking, the city positioned the bicycle lane across the right-turn-only lane for through bicycle traffic. “This ‘crossing’ of the bicycle lane is treated similar to a crosswalk or a lane change. Motorists must yield to bicyclist that has entered their lane of travel using the bicycle lane to cross, just as they would a pedestrian or bicycle crossing at a crosswalk. “However, there is a ‘due care and caution’ (duty) that must be exercised by the operator of the bicycle. They are not allowed to enter/cross the right-turn-only lane of travel suddenly or in such a way that an overtaking vehicle could not safely slow or stop for them to cross. “The bicycle lane does not give either motorist or bicyclist exclusive right of way, both must yield to the lead vehicle to end in an orderly flow of traffic,” Andy said. Lt. Pete Fisher, head of Bremerton police traffic division, says the rules are the same at the Sheridan-Wheaton alignment.